This USMC-issue tactical map shows the CAP 2-7-2 area of operations and bordering areas during my months there in 1970 and 1971. Our area was bordered on the east (right) side by QL-1 (Highway 1) marked by the red line. Our northern (top) boundary was the horizontal line that bisects the number 63 in black grease pencil. Our southern (bottom) boundary was the Thanh Quit River (Song Thanh Quit). Our western (left) boundary was a little indistinct. 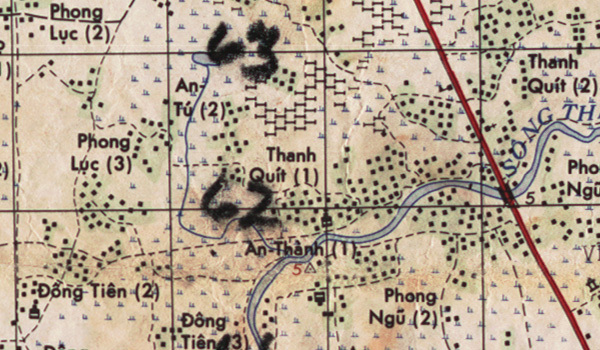 Roughly, it followed the north/south trail (dashed line) from Phong Luc (2), along the western boundary of Phong Luc (3) to where it strikes the river trail north of Dong Tien (3). This map was published by the Defense Mapping Agency and dated 1965.